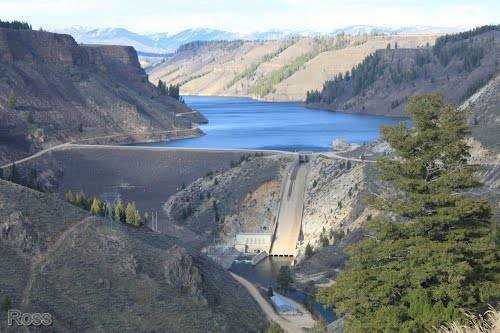 Information was released on the afternoon of April 2, that the Idaho Department of Water Resources has approved an application for Elmore County to pump water out of Anderson Ranch Reservoir in its efforts to replenish the aquifer. The application requested the allocation of water from the reservoir on years that water is being released for flood control measures. This is water that, according to the county and their experts would normally flow out of the state unused. The water right will allow the county to transfer 10,000 acre feet a year from Anderson Ranch to Little Camas Reservoir. From Little Camas the county will use the Mountain Home Irrigation Districts system of canals to move the water down to the gravel pits to help recharge the aquifer. During the hearing process District 23 Senator Bert Brackett spoke in support of the county's efforts. "Water is badly needed in Elmore County as the Mountain Home aquifer is declining approximately two feet per year, " Sen. Brackett said. "Future viability of the City of Mountain Home and the surrounding area is at risk without additional water." District 23 Representative Christy Zito also testified on the county's behalf.For the full story, pick up a copy of the Mountain Home News or click on this link to subscribe to the newspaper's online edition.